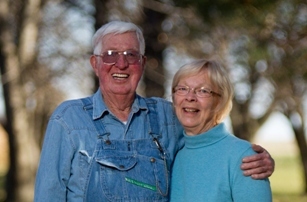 Prairie Retreat is located 2 hours drive time from Sioux Falls, SD. Sioux Falls has the states largest airport. Both Watertown and Huron South Dakota have regional airports that are each 45 minutes drive time to Prairie Retreat. 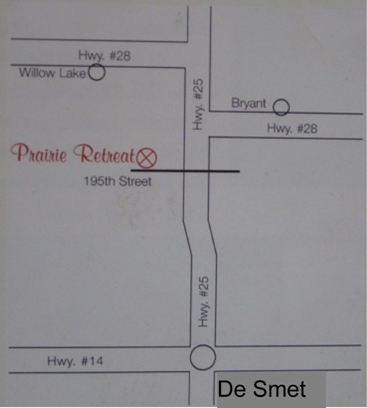 A note to google maps, mapquest, and GPS users; directions to Prairie Retreat are incorrect on those sites and devices. Bryant, South Dakota might sound big time metropolitan, but as Ray likes to say, we still crack daylight with a stick every mornin around here. Apparently the satellites and internet mapping sites agree. Please follow the directions below. Once you get to Hwy. 25 use our little map (also below) to get here. On Hwy. 25 a blue road sign at 195th St. will point you in our direction. Follow Hwy. 14 from Brookings west to De Smet, South Dakota. follow Hwy. #25 from De Smet north to 195th St. Turn west (left) on 195th St. and drive 3 miles. Prairie Retreat is on the north (right) side of the road. follow Hwy. 212 from Watertown west to Hwy. 25. turn south (left) on Hwy. 25. drive 22 miles to 195th St. turn west (right) on 195th St. and drive 3 miles. Prairie Retreat is on the north (right) side of the road. follow Hwy. 14 from Huron east to De Smet, South Dakota. follow Hwy. 25 from De Smet north to 195th St. turn west (left) on 195th St. and drive 3 miles. Prairie Retreat is on the north (right) side of the road.